When Cross Springs’ biggest gossip, Mindy MacPherson, goes after a mysterious rose grower’s secrets, the last person she expects to encounter is her lone one-night stand, Javier Morales Nieto. Mindy had only one regret from her night with Javier: she didn’t have the courage to face him the morning after and see if what they felt for each other was real. Now that she’s forced to work with him, all her fears and doubts are back in full force. Except, she’s pretty sure Javier doesn’t remember who she is. She certainly didn’t realize he was her best friend’s cousin! A little criminal trespass, a massive private greenhouse, a dubious rose supplier, a cache of hidden notebooks and a shocking encounter at a quinceañera add to the drama. But will Mindy and Javier solve the mystery of the prize-winning roses and find their way back into each other’s arms? Only if Mindy faces her fears and admits to him that their close encounter was of the very best kind. The kind that lasts forever. 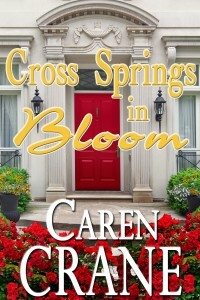 When the emotional stakes are this high, even cut-throat the Cross Springs In Bloom competition looks like a walk in a springtime garden.